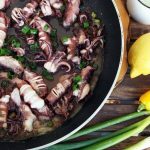 Delicious and healthy Squid with Cream Cheese Chili Dip: Easy 15 minutes Mediterranean squid recipe with chili dip, scallions and lemon juice. Squid is something you don’t eat every day. And if you do eat it, normally it’s cut in rings. It works well for big squids but what if you have small ones? I got 23 baby squids (around 700 g). I must warn you, if your squid is not prepared, you will have to do it by yourself. It’s not hard but you have to repeat the procedure as many times as you have squids. In my case, it was 23. To the end, it went much faster. It didn’t take more than 30 min though, so don’t worry, you won’t need the whole day for it. You can make plenty of things from squid. It’s really delicious and if you are a seafood fan, like I am, this recipe will become one of your favorite ones. It’s really dear to my heart because it reminds me of my honeymoon on Sicily and all those little seafood restaurants along the coast. 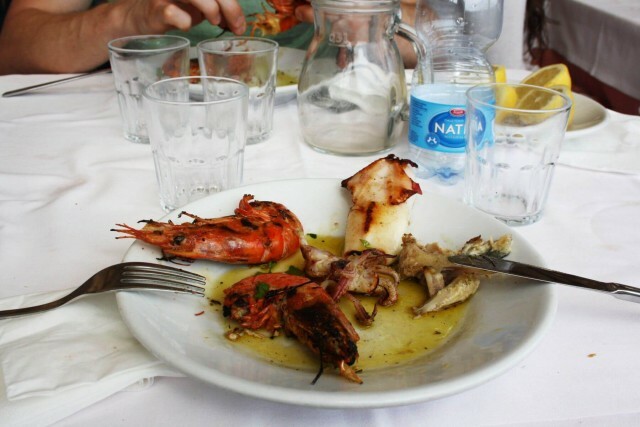 You get a glass of wine, freshly grilled seafood mix, juicy local lemons, ciabatta bread straight from the oven, and a lot of olive oil on your plate. I wish I could have it every day for lunch. And maybe for dinner, too. This grilled baby squid on my plate was just too delicious not to try to make it at home. And I must tell you, it was just as good as this Italian one. And it looks great, too! Now I’m going to tell you how I made it. If you have already prepared baby squids, skip the next paragraph and go straight to the recipe below. If you have unprepared ones, just like I did, keep reading. To start with, wash your squids and drain them. Next step is to gently pull out the tentacles together with the innards, while holding the main body with your other hand. Now you are going to cut the parts which are not edible. Take the tentacles and cut just below the eyes. Keep the tentacles and discard the rest. If there are parts of the beak left, remove them with your fingers. You are done with the first part. Now you have to take the main body and just pull out the cuttlebone (the internal shell) with your fingers. 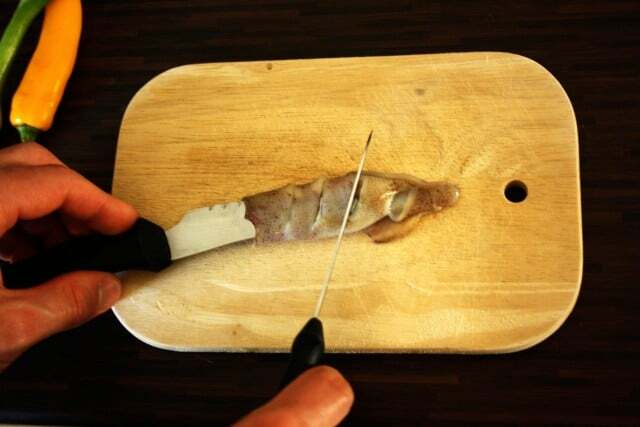 Remove as much of the innards as you can, for example by squeezing them out with the back side of your knife. Once you’re done, wash the squid under running cold water. Now it’s time to chop it just like if you were going to chop it in rings without cutting through. Sounds hard to do? It’s actually the easiest part. Put your squid with its wings on the chopping board. Take 2 knives, one should be as wide as the squid and the second one should be sharp. Put the wide knife inside the body and chop the top of the squid with your sharp knife. The knife inside the body will prevent you from cutting to deep through. If you want to see how it should look like, see the picture below. Et voila! Congratulations, you’ve done the most challenging part. Now comes the fun! First, make the dip: chop the chilli pepper and garlic and mix it with cream cheese, yoghurt and lemon juice. Season it with salt and pepper. Chop the scallions and the chilli pepper. Sprinkle a pinch of salt and ground pepper on your squids and mix it all together. Heat the olive oil in a frying pan over a medium heat. Add chopped chilli and fry for 2 minutes. Turn the heat up. Add the squids and fry for a few minutes (maximum 5), turn them over from time to time, until they firm up and the inside becomes white. It's very easy to overcook squid, so don't miss the moment. Remove from the heat. 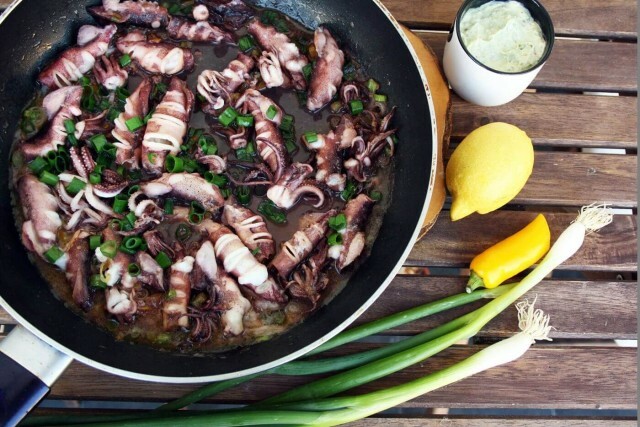 In a small bowl, mix the lemon juice with 2 tablespoons olive oil and drizzle over your squid. Season to taste. Serve with lemon wedges, chili dip and ciabatta bread. Enjoy! 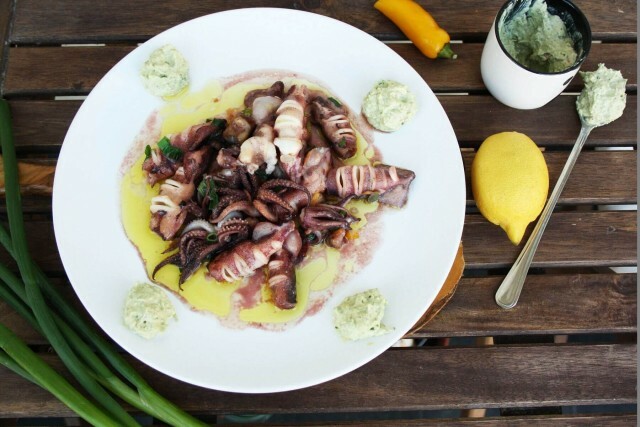 What is your favorite way to cook squid? I would love to hear from you, so please leave a comment below.